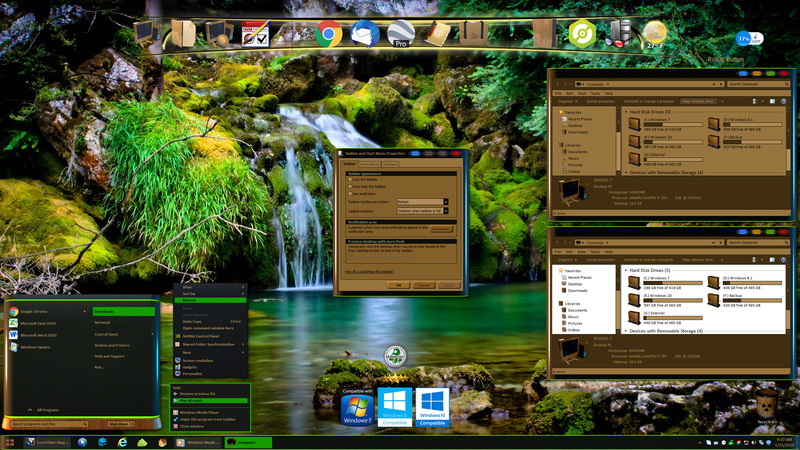 Grande is my latest Windowblinds skin designed for Windows 7, 8 and 10 with dark and light explorer sub-styles. Thought I'd go with Earth tones and the beauty of nature with this one and I think it turned out really good. A roll-up button has been integrated into the skin for those who use it, and many thanks again to RedneckDude for his valued assistance in the testing of this skin. The wallpaper shown is just one I found on the Internet years ago, but I cannot seem to find it again. Thanks to all for your continued support of my work. I hope you all enjoy the look of Grande on your desktop! This gets a ten. and a beer for all your hard LS. I am just starting a new free skin today MisterKilobyte. Top shelf Tom all the way. Peaceful, and beautiful, ready to dip my toes in the water Tom! Very nice...the wall is called Garden of Eden Waterfall, and can be found on google. One of your best Tom! Thanks for posting that! Thanks for the nice comments to everyone. Tom, you're great with color coordination. Love it!